Note: This is the bound book only and does not include access to the Enhanced Pearson eText. To order the Enhanced Pearson eText packaged with a bound book, use ISBN 0134379101. 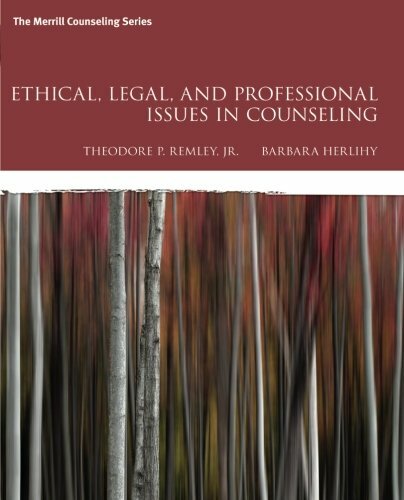 This authoritative resource, written by two counseling professors—one an attorney and the other an expert in ethics—explores the most difficult ethical, legal, and professional challenges in counseling in an easy-to-understand manner. Ideal for instructors who do not specialize in the topics presented, and for students who are learning about the counseling profession, Ethical, Legal, and Professional Issues in Counseling includes numerous case studies throughout not only to highlight difficult situations faced by counselors, but also to give readers the benefit of the authors’ best thinking on how to resolve the dilemmas. The complex legal, ethical, and professional counseling issues are analyzed and discussed in a manner that allows counselors to resolve challenging situations as they arise in their practice. Included is practical advice on how to manage ethical and legal issues such as using technology and social media, counseling minors and vulnerable adults, counseling clients who may be suicidal or violent, responding to subpoenas; setting boundaries with clients, students, and supervisees serving as gatekeepers for the counseling profession; developing a private practice, responding to complaints, and practicing in a diversity-sensitive manner. The topics are relevant for school counselors, clinical mental health counselors, college counselors, rehabilitation counselors, marriage and family counselors, substance abuse counselors, and counselors who practice in other specialties. As a text it is appropriate for undergraduate, master’s level, and doctoral level human services and counseling. The Enhanced Pearson eText features embedded video.